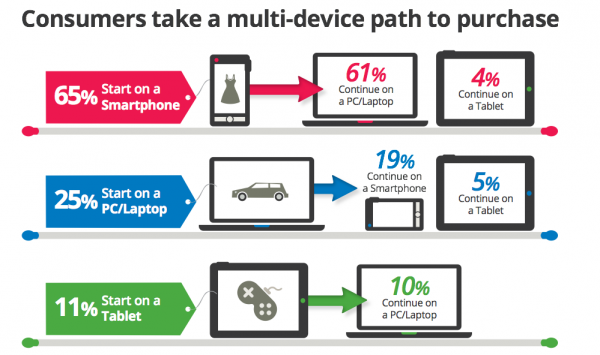 The consumer journey to make a purchase has evolved (and continues to do so) rapidly. There used to be a time when buying only happened in the brick-and-mortar stores and, in the early days of ecommerce, on our personal computers. That type of buying still happens today, however now, people tend to use many different channels and devices in a single purchase cycle. Plus, to make things even more complex, additional channels are added on an ongoing basis. It goes without saying, buying is no longer a linear path. The purchasing journey can become a bumpy ride with lots of detours that eventually can lead to frustration for your customers. That’s why you need to make it as easy as possible for them to get from point A to point B, and why you need to adopt an omni-channel approach to marketing. Unfortunately, very few businesses are winning at this type of cross-channel marketing. Why? Because omni-channel is an extremely misunderstood term and many small businesses don’t even know where to begin. Put simply, omni-channel marketing refers to a business delivering a consistent and uninterrupted brand experience across all channels and devices a customer uses to interact with them. Here’s an example: Suppose you are browsing the website of a fashion retailer on your cell phone. You find a shirt you like, put it in your online cart, get distracted with something else and don’t finish the purchasing process. Fast forward several hours when you’re checking Facebook on your iPad. As you browse through your news feed, you see an ad from the same retailer featuring the same shirt that’s sitting in your online shopping cart. A couple clicks later, and you discover the shirt you selected earlier in the day is still there in your shopping cart. Just as you are ready to checkout, your iPad’s battery dies. You quickly hop onto your laptop, open the website and voila: You are able to finish the purchase. This is how today’s customers expect to buy -- with the convenience of using several synchronized devices and channels. Not only that, the modern customer journey is increasingly taking place both online and offline simultaneously. For instance, a buyer may research and compare prices online and then head to the brick-and-mortar store to actually purchase the product. The opposite scenario also happens when a consumer visits a physical store to buy a product and finds that it is out of stock. Now all he has to do is quickly search for the same item online, place an online order for the same product, and have it shipped directly to his home. To adequately satisfy today’s cross-channel buyers, brands must allow them to pick up from where they left off, no matter where they are in the purchase process. That’s the beauty of omni-channel marketing. The importance of creating one-on-one experiences lies at the heart of the omni-channel marketing approach. Whether it’s B2B or B2C, modern purchasing behavior is driven by personalized engagement, and this is where omni-channel really hits the mark. By letting the buyer control the process and steer it whichever way she wants, you ensure her experience remains seamless and consistent from start to the finish, and perhaps even beyond that. Here are some tips to get you started with your omni-channel marketing strategy. 1. Ditch the old-school thought process. Everything has changed, and it has completely altered the way business is done. Latching onto dated methods and old-fashioned ways will only help your competitors get ahead of you. For instance, the traditional sales funnel is dead. So stop thinking of your customers in in terms of “X” number of leads down the funnel. Treat them as real people and focus on personalizing each of their interactions and experiences with your brand. This approach not only works for omni-channel marketing but forms the base for any good marketing strategy. 2. Get a single view of your customers. This is one of the most important steps in an omni-channel marketing strategy, yet can be the most challenging. It is important because your customers are interacting with your brand from a myriad of different channels. Marketers, therefore, need to create a consolidated and well-coordinated customer profile that provides a holistic picture of the buyer and helps them create a complete customer experience. How you can do that? A few key strategies for getting a better single view of your customers include asking the right questions about your customers’ persona and then using tools and techonlogy to collect and apply the right data. My colleague at V3B, Shelly Kramer, discussed this recently in the light of a new report "Solving the Identity Puzzle,", a leading provider of cross-channel marketing technology. 3. Interact with customers on their preferred channels. We all know how customers are flitting back and forth between multiple devices for a single transaction. For brands to provide a satisfying customer experience, they need to keep all their channels open for customers to interact with them -- be it email, social media, video chat, text messaging, or the plain, old voice call. Marketing without data is practically impossible in the current business environment, and that will likely continue to be reality. Before you get started with your omni-channel marketing approach, you need to have a proper data strategy in place to be able to collect and gain insights from the information that’s pouring in from all corners. The purchase journey is only getting more complicated with different layers and nuances added all the time. With customers in the driver’s seat, marketers have no option but to play by their rules. Omni-channel marketing is a sound step in that direction.